Since the 1970s, U.S. negotiators have concluded bilateral agreements with 28 important trading partners to coordinate social security coverage and benefit provisions for individuals who live and work in more than one country in their working lives. Known as “totalization agreements,” they are similar in function and structure to treaties and are legally classified as congressional-executive agreements concluded pursuant to statute. The agreements have three main purposes: to eliminate double taxation on earnings, to provide benefit protections for workers who have divided their careers between the United States and another country, and to permit unrestricted payment of benefits to residents of the two countries. This article briefly describes totalization agreements, relates their history, and considers proposals to modernize and enhance them. 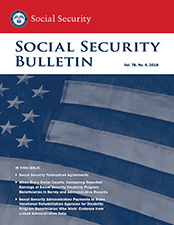 This article examines differences between survey- and administrative data–based estimates of employment and earnings for a sample of Social Security Administration (SSA) disability program beneficiaries. The analysis uses linked records from SSA's National Beneficiary Survey and administrative data from the agency's Master Earnings File. The authors find that estimated employment rates and earnings levels based on administrative data are higher than those based on survey data for beneficiaries overall and by sociodemographic subgroup. In proportional terms, the differences between survey and administrative data tend to be greater among subgroups with survey-reported employment rates that are lower than that of beneficiaries overall.